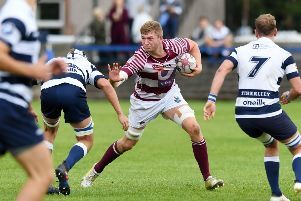 Currie coach Ben Cairns insists his players will take a patient approach as they seek a bonus point win in tomorrow’s rearranged BT Premiership match away to Boroughmuir (kick off 1.30pm). The visitors must take all five league points to clinch fourth place in the table and secure the final play-off spot. Failure to do so will see title holders Heriot’s progress to the knockout stages. Cairns is again without his Scotland under-20 contingent who will be on international duty against their English counterparts at Northampton tomorrow evening. And, with Glasgow Warriors not releasing Ratu Tagive, Matt Hooks comes in at centre while Ruaraidh Smith starts on the wing. Ruaridh Young takes his place on the bench and is set to make his first appearance since suffering a long-term injury away to Boroughmuir last season. Looking ahead to the match that will define Currie’s season, Cairns said, “We need to start well and build into the game. We want to take it by the scruff of the neck early but we are not chasing tries early doors. That’s the key. We build our scores and if points are on offer we take them. Home coach Peter Wright also has several players unavailable, so hands starting berths to Stuart Clark, Michael Henry and Ali McLeod, with youngster Oli Davidson among the subs.